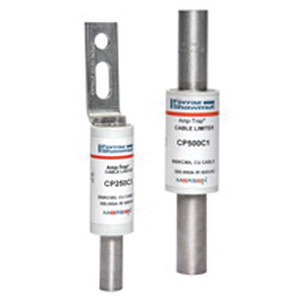 Mersen CP Series Special-purpose cable protector fuse is rated at 600-Volt AC. Interrupt rating of this fuse is 200-Kilo-Amps at 600-Volt AC. The fuse of dimension 2.5-Inch Dia x 14.19-Inch, has cylindrical GMG/neoprene coated rubber body. Fuse with cable-to-cable terminal connection, supports crimp, crimp and bolt-on and bolt-on mounting. Fuse is UL listed.